Hi Terri. I am sorry you haven't been feeling to well. Tea will certainly help! I love old postcards...they are such a window on a lost way of life. When my husband called his mother in England to tell her we were getting married in 1974, she had never spoken on the phone before and was quite frightened of it. We called our niece's home where we knew she would be, to talk to her. Her voice shook the whole time and she could barely talk. How things have changed! Thanks for hosting, and I hope you'll feel better quickly. 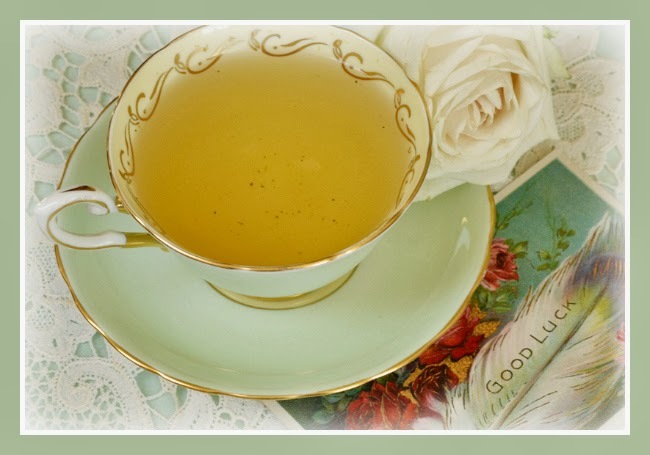 Hello my dear Teacup Tuesday host! 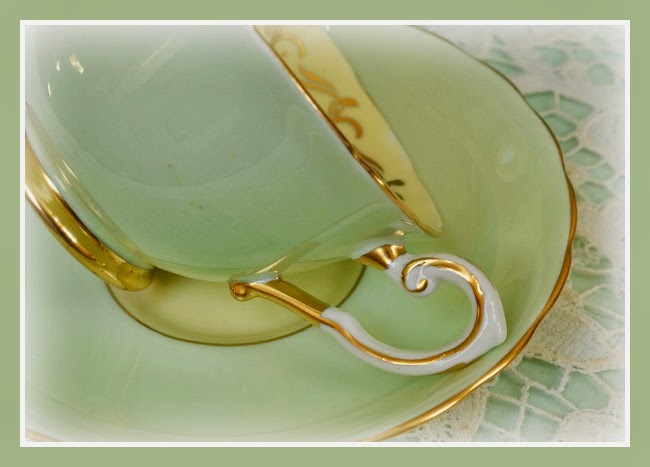 What a delightful and simple cup and saucer - the colour is so delicate rimmed in gold. Yes a truly fascinating vintage card and story. It is amazing that drinking tea even 100 years or more later still unites us even in blogland despite the speed of how things have changed. I feel quite nostalgic when I think that friends and family rarely put pen to paper or card to communicate anymore! Terri, that tea cup would have been perfect for my mint tea yesterday. I love postcards and letters too and collect the very old ones. They always have to have some message on them for me though; the pretty picture isn't enough. Hope you're feeling better now. Big hugs from Mexico. Lovey tea time story! Nice cup. I love old postcards, especially used ones. So interesting! Wen I was studying in Amsterdam early 70's, I had to go to a phone boot to call my parents and friends. Now you can hardly find a phone boot. They are all gone! And of course I now skype with my daughter in the States! 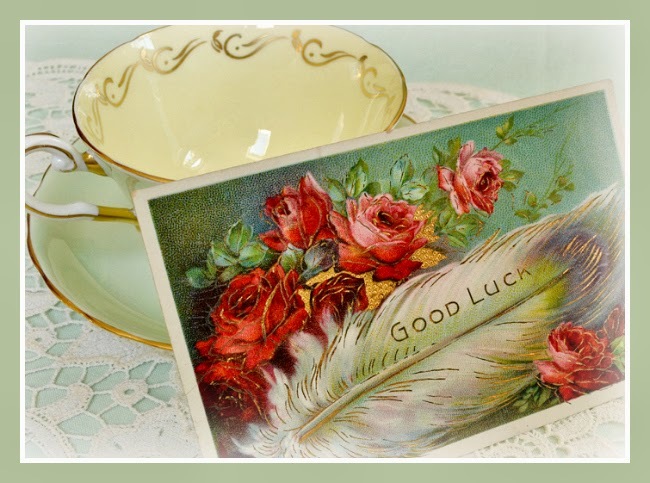 What a pretty teacup and vintage postcard. I love the way you have found out the history of the sender and receiver of the card. Times have certainly changed but but how nice that tea time is still as special as ever. Hope you are feeling better. Terri, I hope you feel better soon. I was under the weather all weekend. Will be glad when this winter is over. Your mint teacup is a beauty! Such a beautiful colour! I enjoyed your info about the post card. They are fascinating, aren't they? Thank you for sharing and take care, my friend. Fun post, Terri. Lovely, simple teacup ... elegant. 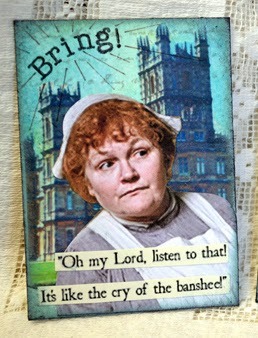 I've always thought it would be wonderful if postcards could "talk". What stories they could tell ... a lot like your post today. Be well! Thanks for hosting and Happy Tea Day! Sorry you are not feeling well. Hope it will improve. Tea will help. I loved the postcard and things you were able to learn about the lady! What an elegant tea cup! Love the shape, and how it shows off your tea so nicely. Glad you are feeling better. I had fun reading about the postcard and the research you did into it. What a fun idea! Hope your feeling better. It is amazing to think of what it would have been like 100 years ago. I came form two generations of very young parents and I happen to know my Great-Grandfather until I was 24. He would tell stories of taking the wagon 20 miles to the biggest city to sell a load of tobbacco in the spring, and the mud was so deep in the roads it would come almost halfway up on the wagon wheel. Today we just couldn't imagine with all of our conviences. Thanks for hosting! I just loved your blog today! Brought back memories of my Grandma. Thank you so much! I enjoy your tea cup Tuesdays! I do hope that you are feeling better. I want to stop by to say how much I enjoyed your post about "the postcard". Very enjoyable, and it gave me a little video in my mind! Take care. Sorry to hear you were under the weather; glad to see you are back. I totally enjoy looking at your beautiful Tea Cup Tuesday posts. I hope that you are all well again and feeling good ? their lives were lived ,and what happened to them... It is amazing yes ,that we can track persons today, and sad that we have almost forgot to cummunicate via real letter writing -but so good not to have to wait for messages ,for dayes and weeks like before. Well that reminds me, that I so hope the packet will soon be with you, my friend. 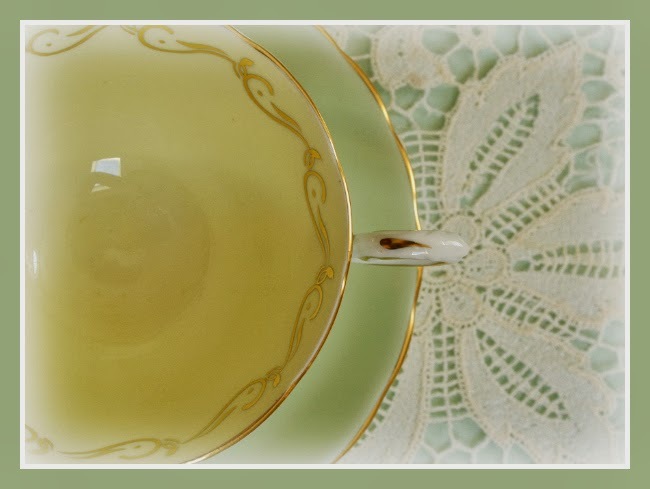 Your cup looks so lovely and in the sweetest soft aqua colour,-just a favorite of yours. So sorry you haven't been well, Terri. Hope you're over the worst now. I love how much you have been able to discover about the background of your postcard and it shiws that however much the modes of communication have changed, human feelins and emotions are much as they are. And when they finally managed to get together they no doubt had a soothing cup of tea p, maybe even from a cup just like this beauty. My heart has been warmed by your post - - You have created an image and sparked a memories. My grandmother and soul inspiration who I loved deeply had the name Edna and your post fit perfect with my memory seeing her sitting at the table writing out post cards or letters. I so enjoyed your post today and wish you feeling better. Perhaps drinking tea from that lovely cup will make all the difference in the world. Hello Terri. Happy Tuesday. I am sorry to hear that you are not feeling well. I hope all the blog love here helps you feel a bit better. I love that sweet tea time story. How charming. Soory you've been sick and I hope you get all better soon, my friend. The teacup is gorgeous and the herb tea must be delish. Oh, I still have post cards from my parents when they went traveling and us too. What a change in technology these days. My daughter is with her family in NYC, (my home town) and I'm connected all the time with pictures and even videos, lol! Have a lovely week and thanks for the party. I'm glad you are back! I loved reading about your family through the postcard!! 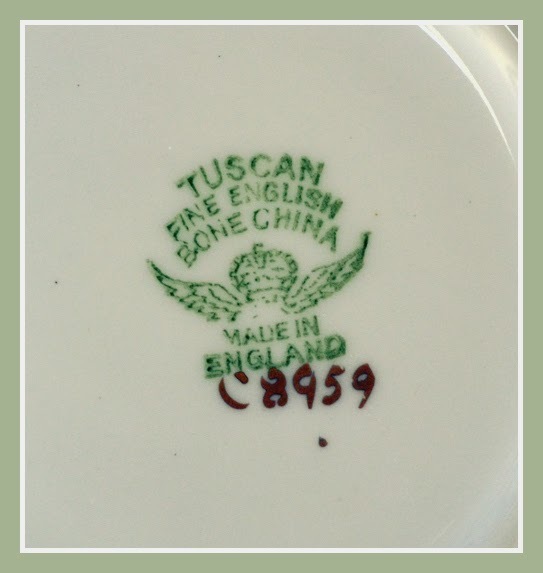 Isn't it fun to look through family heirlooms? You have a lovely teacup to sip that delicious sounding tea. Hope it helps you feel better soon! Thanks for hosting a delightful party! A perfectly delightful post, Terri! Your mint green and gold teacup featured is a stunner - such a creamy pastel shade with just the right elegant gold flourishes! But the postcard captivated me at the first! 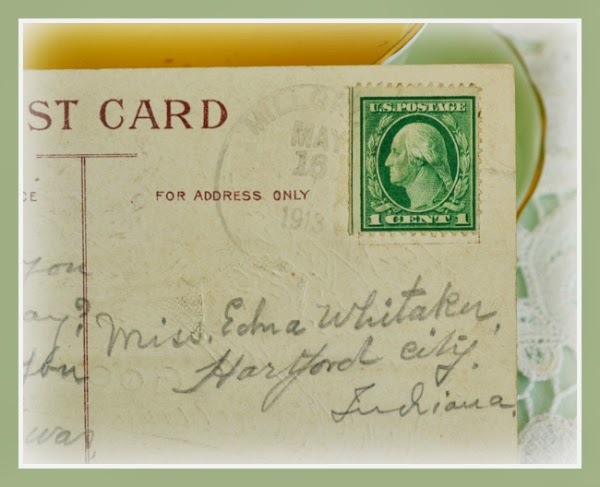 I LOVE ephemera and you're right - every postcard stamped and written on has a story behind it. So cool how you googled the names and came up with little details. I can form a picture in my head and like you, begin to see the script behind the scene this postcard gives us clues to. Just another day in the life of one who lived long ago - not much different than we are. I expect they enjoyed tea, too! P.S. Hope you'll link something up with my new monthly LINKUP in celebration of my Blogoversary! Details in my post today. what a sweet tea post. I love the beautiful tea cup. You are so right, it is very elegant and distinguished. I love the postcard and your research about it. Thats so interesting to see which story is connected with the post cards. I have found several postcards with interesting correspondence concerning the Hanau Silversmiths. Most of them on ebay. If you have a hometown of your own ancestries its interesting to search for their mail. Online offers mostly tell you the Poststamps and sometimes the address. Really an amazing theme. That was a sweet tea time with Grandma and Granddaughter Edna. Thank you for this wonderful tea time and for hosting this sweet party. 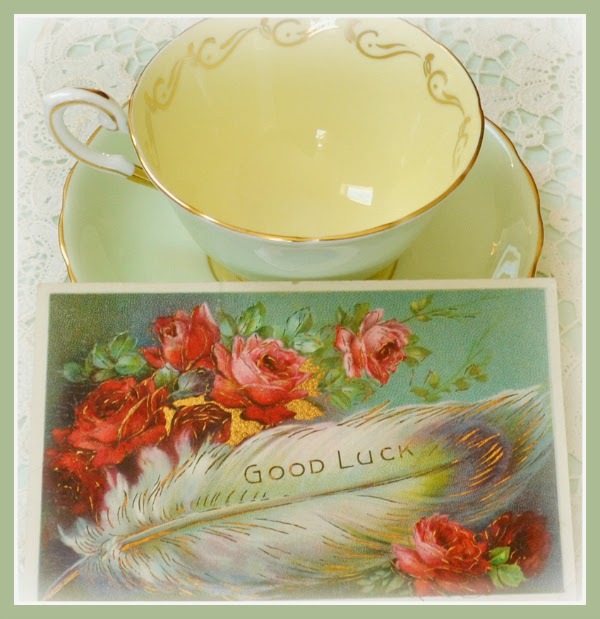 Thanks for sharing the pretty teacup and the vintage postcard! 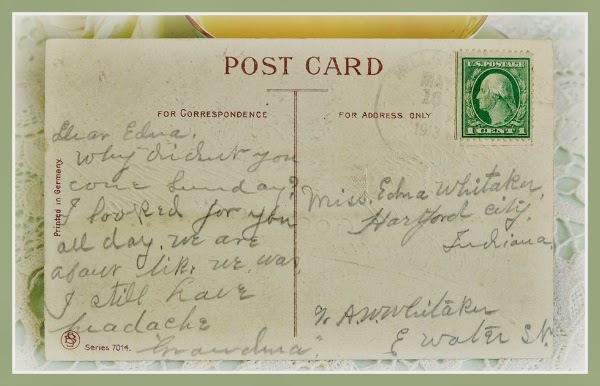 That one postcard lead you to discover new things about a person who lived over a hundred years ago! Lovely teacup Terri. Such a pretty color. I love to look at vintage postcards, but never thought to investigate like you did. Really interesting. I love how they didn't have to put a zip code down, and sometimes not even a street address. Hope you feel better, and thanks for visiting me! Oh my, you sure did some research and put a lot of thought into this post. Isn't amazing how brief their addresses were too! This was really fun! So glad you shared at Friends Sharing Tea! mint green cups are a joy to drink from, it reminds people of spring and summer. What a beautiful and pleasing post. I love every picture. You have a gift at taking them and making each one so interesting. You teacup, postcard and writing are most special. I love old postcards too and what we can imagine about them. Reading the comments here, I think Ruth Weston's is so interesting and such a sweet memory. I hope you feel better Terri! Such a special postcard, 100 years ago...how times have changed...how different is our life, but the essentiels like a cup of tea remains! Terri, I'm late, I'm late for an important Tea Party! I'm so very happy to be here! My first tea party here and I'm loving it! You are a such a wonderful host. Your tea cup is exquisite and that postcard is just precious. Thank you for sharing the story, a fascinating and wonderful one. 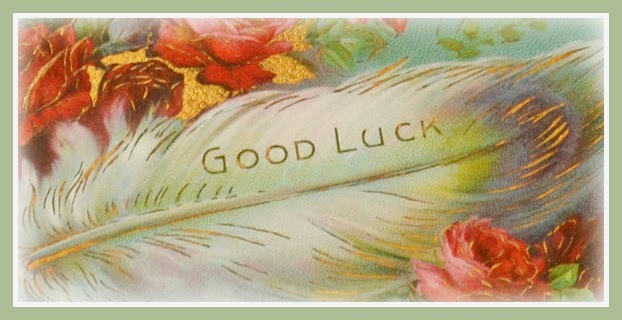 Hope you are feeling better now Teri. Hi, Terry. Glad to hear you are feeling better. What a lovely cup, simple yet elegant. What a wonderful story about the postcard. It is amazing how much things have changed. Looking at the handwriting it reminds me very much of my grandmother's. It brought back happy memories of her. Thanks for sharing. I love old postcards,and the stories they tell, too. They're a tangible link to the past. I think Grandma and Edna would be tickled to know that someone was thinking of them long after they left this world, and I think they would have been delighted to join you for tea! Especially with that simple, yet elegant, green tea cup. Terri, You are right. Your tea cup stands just fine without any fanfare! It is gorgeous. I adore the mint color and how shiny it is. I sure wish I had some of the old postcards my granny sent when I was a young girl. They would be fabulous for my scrapbooking. Have a blessed week! Hi Terri, I love old postcards too! Your teacup is really pretty, as always. I think we all need some sunshine and warm weather. Your Teacup and Photography are Beautiful... and I'm sure the Sharing of that Wonderful Old piece of Beautiful Correspondence keeps the Sentiment of it very much Alive even to this day! I for one miss receiving 'Old School' Style written correspondence... even tho' I do Love the Land of Blog and all of this Technology that makes the World a much smaller and more intimate place by connecting so many Kindred Spirits so easily!